Hope everyone had a lovely weekend. Thank you so much for the kind words on Steven’s guest post Thursday; he and I were both really touched by all of the positive responses. I’m excited for him to be a CR guest blogger a little more often. 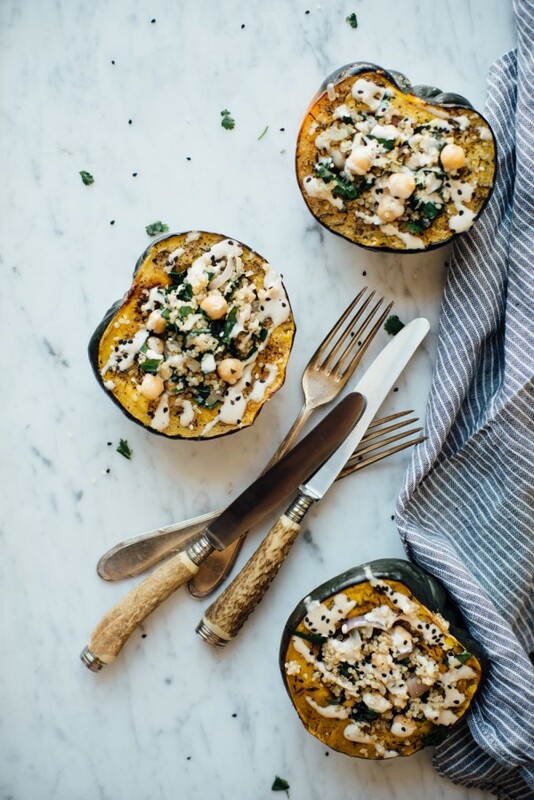 These stuffed acorn squash with tahini sauce from Dolly and Oatmeal look almost illegally good. Perfect holiday entree, too. 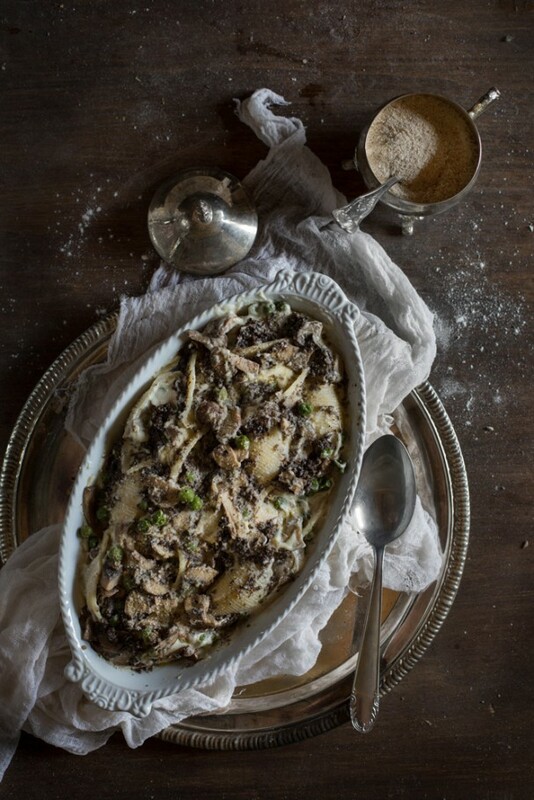 Valentina Solfrini’s vegan shell bake with mushrooms and truffles–guest posted on Elenore’s blog–is blowing my mind. 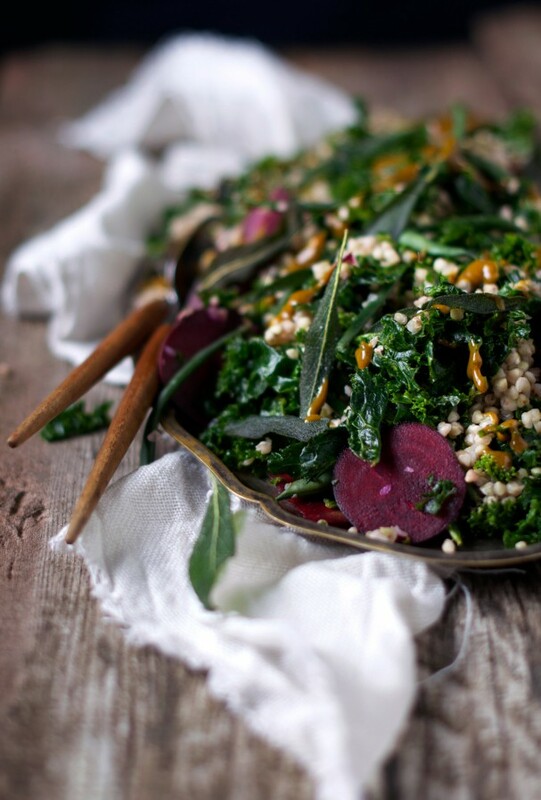 Speaking of Ms. Earthsprout, I’m in love with her buckwheat salad with turmeric dressing and fried sage. 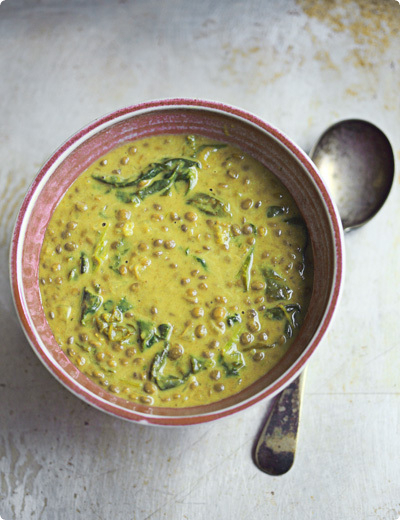 The blog post introducing this green lentil soup with coconut milk and warm spices is “cold comfort.” It looks warming and comforting indeed. 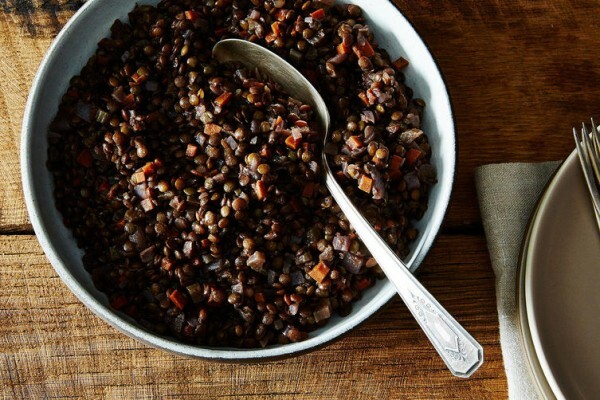 Finally, Nicholas Day shows us how to make Zuni cafe’s red wine braised lentils in his Food52 column. Nick, I’m sold. 1. I enjoyed Richard Friedman’s op-ed on ADHD in the New York Times this weekend. While I’m admittedly no expert on this topic, I thought that his placing ADHD in an evolutionary biology framework was interesting, and that his ultimate conclusions both hopeful and constructive. “The researchers found that every home has a unique bacterial fingerprint, which follows families when they move. When comparing the surfaces of the old and new homes, researchers found them almost identical in microbial makeup – suggesting that our bacteria settle down in new places before our boxes are even unpacked. What’s more, a household’s fingerprint is unique enough that the researchers could use an unidentified floor sample to predict which of the seven families it came from. 3. Also cool: Johnny Rockets is going to start offering Gardein products as non-meat options. A great sign that plant-based diets are becoming more mainstream! 4. Speaking of vegan diets entering the mainstream, 4% of the Israeli population is now vegan, making Israel the potential vegan capital of the world. Seems like a nice note to end on, right? Happy Sunday, friends. That’s funny about the bacteria. I have always said (around my family anyway) that everyone has their own unique smell and that families do too. People I don’t get along with literally have a smell that is repulse to me! Interesting take on ADHD. I have always found the observations about our social environments and the uptick in ADHD diagnoses compelling too. How are we selecting for and rewarding certain types of behavior in our schools, workplaces, and via the internet–and from these environments forming our assumptions about what is normal and abnormal human activity? my only problem with JR introducing gardein products, is that now (most) everyone will see vegan foods as meat substitutes, not real, whole foods- which is what they really are. it is nice that they are offering more options, though. just kind of frustrating. But all foods, vegan or not, can appear in their most unadulterated form, or in a somewhat processed form. It’s too bad that public perception of vegan food is centered on meat substitutes, but even so, I don’t think that vegans are under any particular obligation to eat 100% whole food (and I’d hesitate to make big claims about what vegan food is or isn’t — it’s so variable). It’s great to show off vegan foods that are whole and vegetable centric, and I’m always quick to point out (if someone isn’t very familiar with veganism) that vegan food is a lot richer than boca burgers and rice 🙂 But at the end of the day, meat substitutes serve a vital purpose in helping those who have chosen to eschew animal flesh and products an option that is reminiscent of some of the foods they remember fondly. And if that motivates folks to stay committed to a kinder, more compassionate diet, than I couldn’t be more for it. True, Johnny Rocket isn’t showing off the most creative vegan fare, but then again, the menu itself is comfort food centric, and so Gardein feels fitting. At the end of the day, I think what matters is that this is a step forward for animals, and a sign that vegan consumers are being heard. Hi Gena, I always look forward to your weekend reading posts! Just a note: we all may want to delve further into the story about the Galapagos turtles before celebrating it too unequivocally. Apparently large numbers of these feral goats were used and then slaughtered in the process of making the island more habitable for the turtles. I heard an excellent podcast on this topic recently (radiolab?). I will try to find it and link to it here. It’s a difficult ethical position to navigate because I, like you, want to celebrate the protection of such a beautiful species. But is it worth the cost when it involves the wholesale use and slaughter of another animal population? Yay!! My favorite! 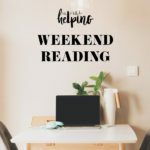 I love the weekend readings! Thanks again!